Guess what? You can now print on glitter! Easy and no mess. No really, the glitter does not flake. How great is that? 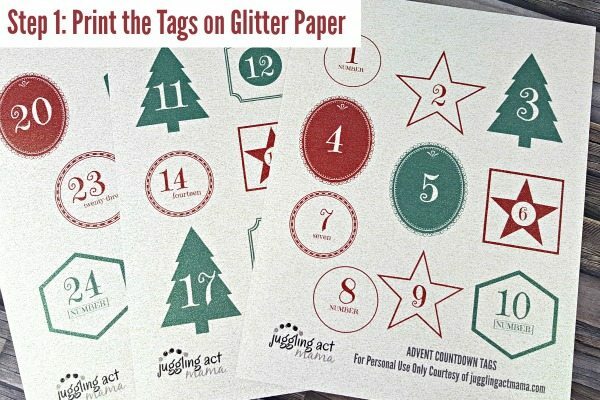 I just love the way these Advent Countdown Tags look with the Core’dinations Glitter Prints: Inkjet Printable Glitter Paper. It gives them a very elegant touch that is just perfect for the holidays. Twinkling Christmas lights pick up the glitter and really make my Advent packages sparkle! 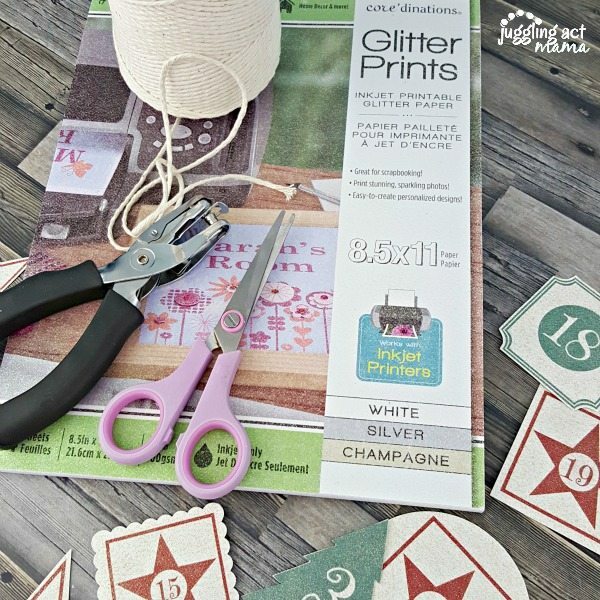 The paper is a great way to personalize gifts with pretty gift tags, or handmade cards. I wanted a way to dress up our Advent project. 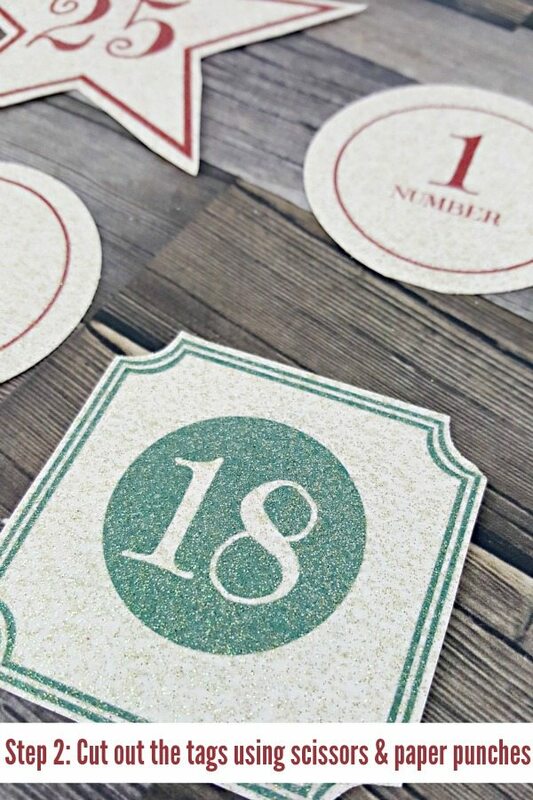 I created some lovely Advent Countdown Tags first. I’ll admit that I think they’re pretty great the way they are. But printing them on the glitter paper takes them to a whole other level! 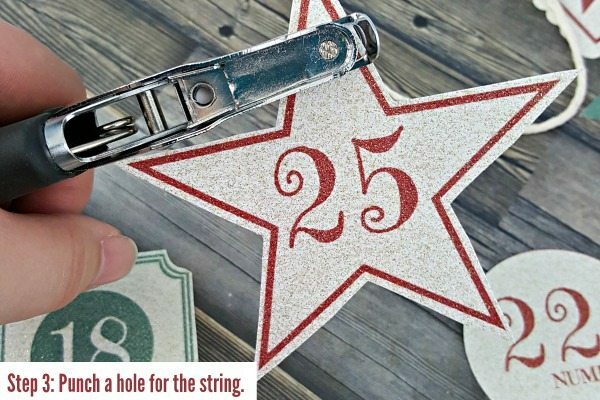 Here’s what you need to know – this Inkjet Printable Glitter Paper from Core’dinations is extremely easy to personalize and use. It works with any inkjet printer at home or the office. This is a very thick paper. I thought for sure it would jam in my printer, but it sailed right through! I was really impressed by it. It truly is a unique, smooth glitter paper specially designed for printing with optimal color vibrancy. You can purchase the Core’dinations Glitter Prints: Inkjet Printable Glitter Paper at Hobby Lobby or Michael’s. I used the Champagne colored glitter paper. The first thing you’ll need to do is download the Advent Countdown Tags. Next, load the glitter paper into your inkjet printer and print. Cut out all the tags. I used scissors for some of the shapes. Then, to add a bit more character, I used different paper punches for some of the others. I love how the mismatched set still looks coordinated together! Finally, punch a hole in the tags and add the string, bakers twine or ribbon. 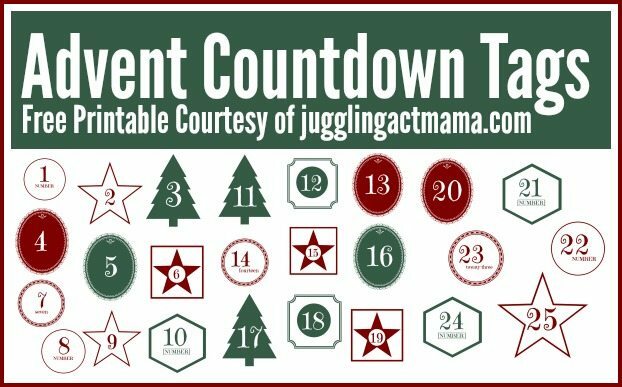 Now you’re ready to use your Advent Countdown Tags! We plan to use our tags on wrapped books. The kids will get to open one gift each day leading up to Christmas. For this, I printed two sets of tags (one for each child). I can’t wait to see their faces when we bring out their little ‘Christmas Tree’ of books with the Advent Countdown Tags! These are great! I’ve been looking for something like this!